What is fuel excise duty? Excise duty is applied to all petrol sold in New Zealand and is collected to help fund safety upgrades, public transport, walking and cycling projects and regional roads. If you buy and use petrol off-road within your business (for example, for use in your quad bike) you may be in for a fuel excise refund. For more information, click on the links at the bottom of this article. Does the refund include GST? Rebates that you receive as a shareholder from Farmlands, Ravensdown, Ballance etc don't generally include GST (but it's always best to check with your accountant). On the other hand, your Excise Duty refund is subject to GST and any refunds received should be included in the GST period it relates to. How should I record it in Cashmanager? 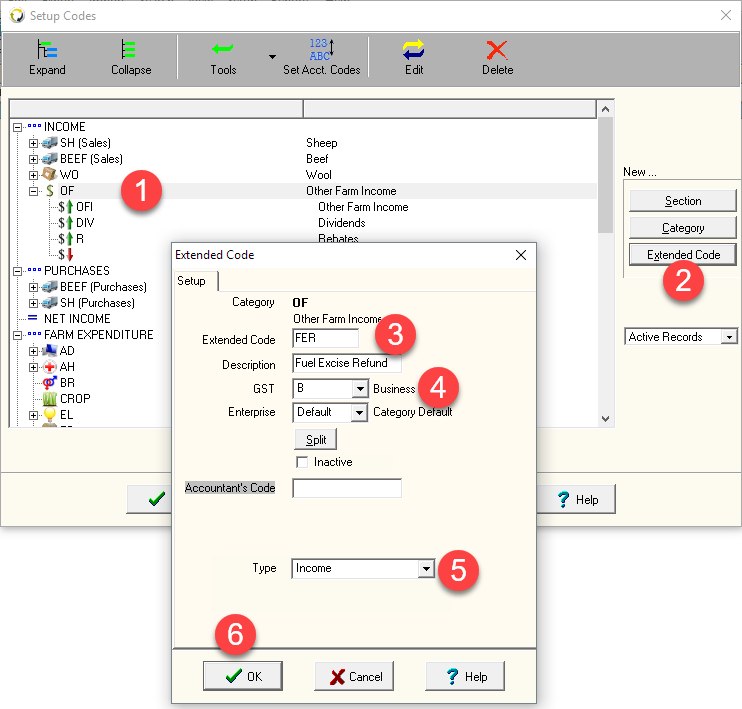 When it comes to coding the transaction, we recommend that you create a new extended code within your Other Farm Income category specifically for excise fuel refunds. In the Transactions screen, click on the Setup - Codes menu. Highlight the Category code, Other Farm Income (OF). Under the 'New' area, click on Extended Code. Enter a Code and Description that make sense to you. Set the GST to B (Business). Set the Type to Income.